Each year there’s always a store where I buy more clothes. This year is Zara. The first thing that I bought is this beautiful faux suede drape dress. I think the rouching on the centre makes the dress really flattering. It took me a long time to find a bodycon dress that looks perfect and has a nice length. I bought it in a size L and its price is only 10€. Here is the link. Cada año siempre hay una tienda en la que compro más ropa. Este año es Zara. Lo primero que compré es este hermoso vestido drapeado de ante sintético. Creo que el fruncido del centro hace que el vestido sea realmente favorecedor. Me costo mucho encontrar un vestido ajustado que me quedase perfecto y tuviera una longitud agradable. Lo compré en talla L y su precio es de solo 10€. Aquí está el enlace . In Zara I also bought this beautiful Chanel looking jacket. I think it looks really elegant and will elevate any look. Since it is a bit cropped it doesn’t look too classic. I bought it in a size S and its price is 10€. Here is the link. En Zara también compré esta hermosa chaqueta con aspecto de Chanel. Creo que es muy elegante y elevará cualquier look. Como es un poco cropped no parece demasiado de señora. La compré en una talla S y su precio es de 10€. Aquí está el enlace . The last item I bought in Zara is this light pink t-shirt. I love the contrast ribbed trims on the sleeves and the fact that’s not too long. Its price is only 4€ and I bought it in a size M. Here is the link. 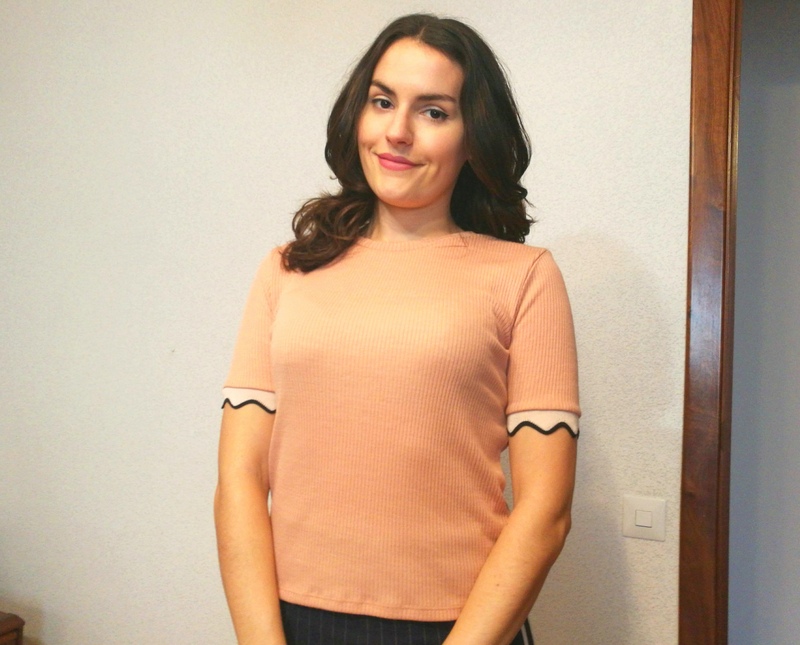 El último artículo que compré en Zara es esta camiseta rosa clara. Me encantan los ribetes a contraste en las mangas y que no es muy larga. Su precio es de sólo 4€ y la compré en una M. Aquí está el enlace . I bought this beautiful t-shirt from Bershka. I love it because it has a quite elegant print with the little pearls and the embroidery letters. 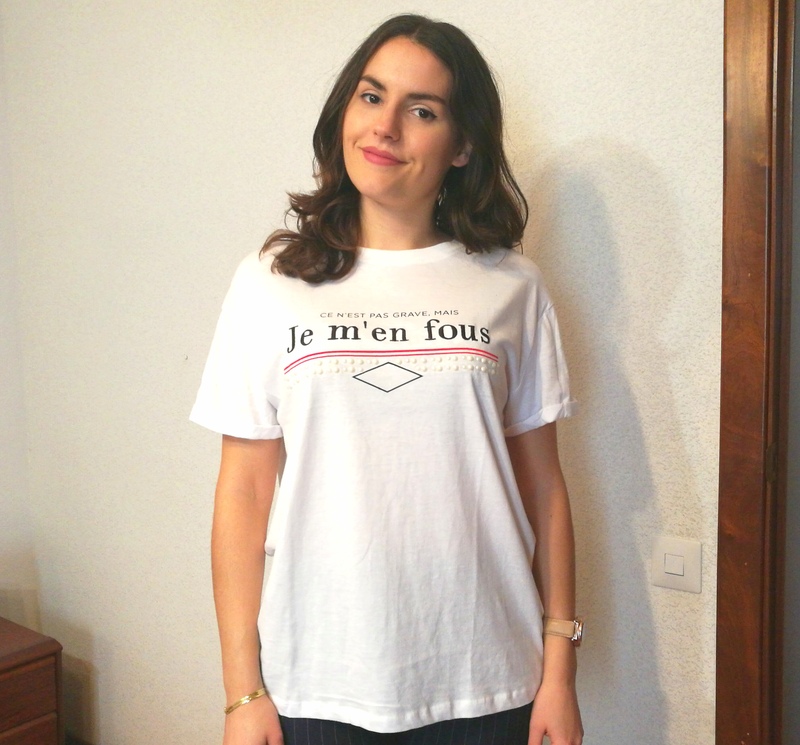 It’s not easy to find a t-shirt that’s not completely basic and looks elegant at the same time. This one was only 4€ from Bershka. It runs a bit big so I’d suggest to go down one or two sizes. Here is the link. Compré esta hermosa camiseta de Bershka. Me encanta porque tiene un print bastante elegante con las pequeñas perlas y las letras berdadas. No es fácil encontrar una camiseta que no sea completamente básica y que sea elegante al mismo tiempo. Esta era de solo 4€ de Bershka. Es un poco grande, así que sugiero bajar uno o dos tallas. Aquí está el enlace . 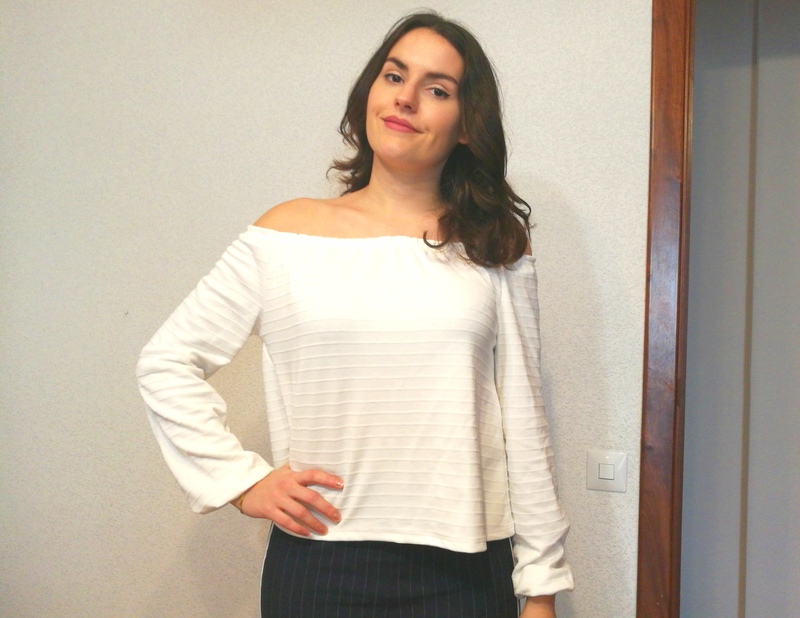 In Bershka I also bought this off the shoulder white long sleeve t-shirt. Lately I’ve been loving how off-the-shoulder clothes look like. I bought it in size S and its price was only 4€. En Bershka también compré esta camiseta de manga larga blanca con hombros descubiertos. 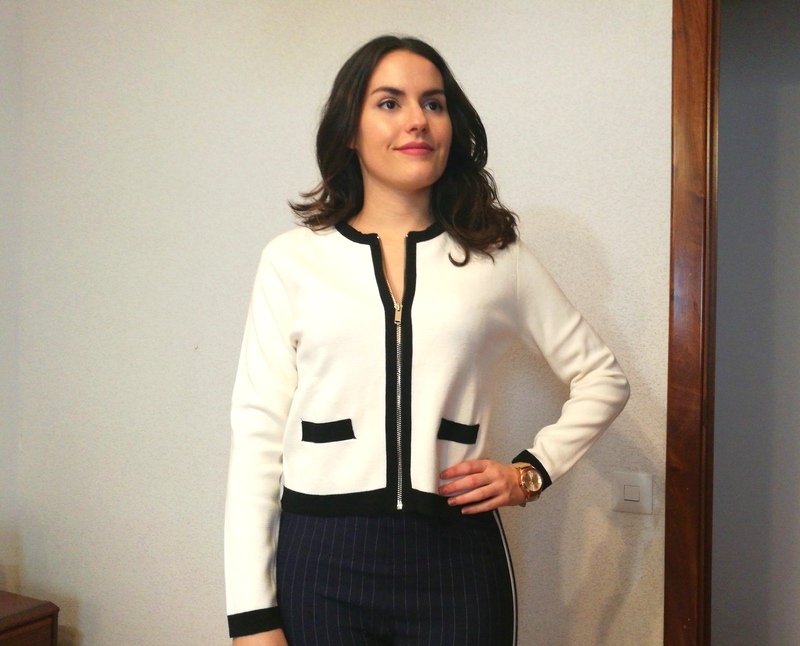 Últimamente me ha encantado el look de la ropa con los hombros al descubierto. La compré en talla S y su precio fue de solo 4€. Finally in Primark I bough this all black trainers. I have to say that Primark trainers are very comfortable for an everyday use. I love wearing colour block trainers because they are very comfortable but they look more put together. Their price on sales was only 5€. 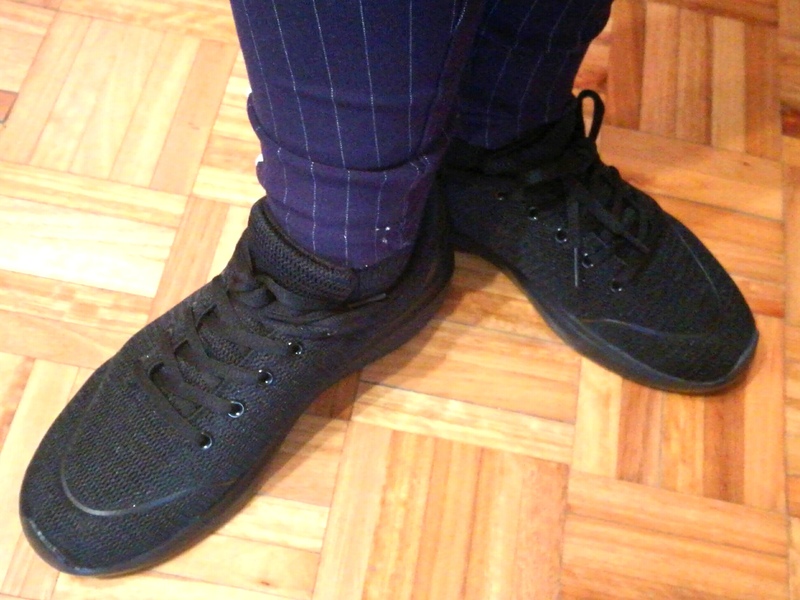 Finalmente, en Primark compré estas deportivas totalmente negras. Tengo que decir que las deportivas de Primark son muy cómodas para un uso diario. Me encanta usar deportivas de un solo color porque son muy cómodas pero quedan más elegantes. Su precio de venta fue de solo 5 €. What’s your favourite piece of this haul? Have you already gone shopping on the Winter sales? ¿Cuál es tu prenda favorita de este haul?¿Ya has ido de compras en las rebajas de invierno? The last thing I bought was a comfy black sweater with rhinestones. I love it & it’s perfect for the winter! I really like the dress, the colour and design is so flattering. I like the white long sleeved top the best. You look so lovely in it. Since I am still on the road, I buy very few clothes. My lifestyle right now, too, is limited and I mostly am at “home”, running errands or walking outside, so all my clothes are casual and comfy. The last thing I bought was a flannel t-shirt since I’m presently staying in a cold weather climate. I love all these looks. You look great! I like the Chanel looking blazer. You got such cute items, I especially like the jacket and pink scalloped tee! everything looks so good, but i think the dress looks awesome on you. The Zara jacket looks lovely on you! So Versatile too. Lots of 1940’s elements in this dress style! I enjoy looking through all your posts – although you don’t focus on vintage, scrolling through the photos and topics you cover, it’s all a blast from the past full of classic designs and ideas. These things never expire. Thanks for visiting and LIKING my fun, too – photos of true vintage fashion finds from my own wardrobe collection. Some really great looks in here. Thanks for sharing this with us. Definite inspiration in here! Oh my – I LOVE that first dress! I always feel like European Zara has way better items than American Zara! Lucky ducks!